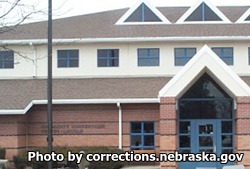 The Community Corrections Center in Lincoln Nebraska is a minimum custody work release center for both male and female inmates. Currently Community Corrections Center Lincoln has a capacity of 88 females and 312 males. The facility itself is comprised of four housing units, three of which are male units, one is a female unit. Inmates are either Community A or Community B custody levels. Community A inmates are given a specific job role within the facility, or on a supervised road crew, or other work detail within the surrounding community; community A inmates are also issued clothes, given room and board and earn a daily wage. Community B inmates are also assigned work detail, but are mostly employed in a work release within the surrounding community; community B inmates must pay $12 per day room and board fee, and must purchase their own clothes. Community Corrections Center Lincoln is responsible for preparing inmates for the transition from incarcerated life to normal productive citizen life. The facility accomplishes this by giving inmates an increase in responsibility as their supervision is gradually decreased. Inmates at this correctional center can earn a GED, gain an adult basic education, receive substance abuse treatment and other counseling while incarcerated. Visiting days and times depend on which housing unit the inmate is located in. New Years Day, Howard's Day (September 2), Thanksgiving Day and Christmas Day 8am-10am. Please note this facility changes visiting hours every few months, so you should always call first to confirm visiting hours before attending a visiting session.